Pages in category "Landlocked countries"
Turkmenistan is a landlocked country in Central Asia, bordering the Caspian Sea to the west, Iran and Afghanistan to the south, Uzbekistan to the north-east, and Kazakhstan to the north-west. It is the southernmost republic of the Commonwealth of Independent States (CIS), the loose federation created at the end of 1991 by most of the Post-Soviet states. 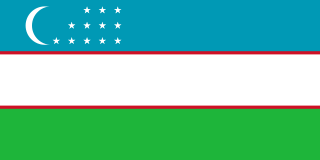 Uzbekistan is a country of Central Asia, located north of Turkmenistan and Afghanistan. With an area of 447,000 square kilometers, Uzbekistan stretches 1,425 km (885 mi) from west to east and 930 km (580 mi) from north to south. Bordering Turkmenistan to the southwest, Kazakhstan to the north, and Tajikistan and Kyrgyzstan to the south and east. A landlocked navy is a naval force operated by a country which does not have a coastline. While such states are obviously unable to develop a sea-going, blue-water navy, they may still deploy armed forces on major lakes or rivers. This page lists diplomatic missions resident in the Swiss Confederation and that are accredited to Switzerland. At present, the capital city of Bern hosts 89 embassies, while Geneva, which hosts the headquarters of the United Nations in Europe, hosts 54 missions, which are accredited to Switzerland as embassies. Several other countries have ambassadors accredited to Switzerland, with most being resident in Berlin, Brussels or Paris. International relations between the Republic of Chile and the Plurinational State of Bolivia have been strained ever since independence in the early 19th century because of the Atacama border dispute. Relations soured even more after Bolivia lost its coast to Chile during the War of the Pacific and became a landlocked country. Chile and Bolivia have maintained only consular relations since 1978, when territorial negotiations failed and Bolivia decided to sever diplomatic relations with Chile. However, in spite of straining relationship, Chile and Bolivia still have economic treaties supporting tourism and cooperation; therefore, trading between two nations is not affected by the territorial dispute.